This 8+ GB library is the genuine combination of Cinematic and Ambient guitars leaving you with the best sounds for your productions money can buy. 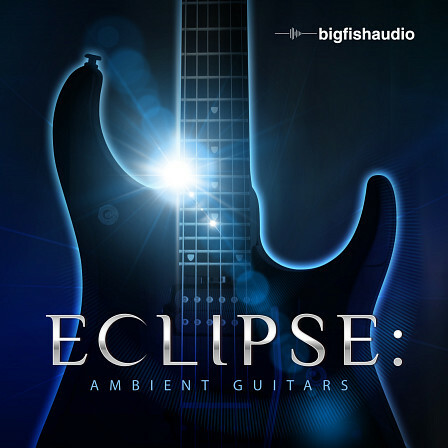 Eclipse: Ambient Guitars is a new breed of library being offered from Big Fish Audio. Played by world renowned guitarist, Ernie Albert, this library offers something that none other does; loops, sounds, FX and patches from an industry professional tailored to your exact needs. This library contains 2,270 total loops (738 original WAV loops) of guitar melodies, guitar FX, lush guitar pads, guitar percussion, reverse guitars, ambient guitars, processed guitars and many, many more! 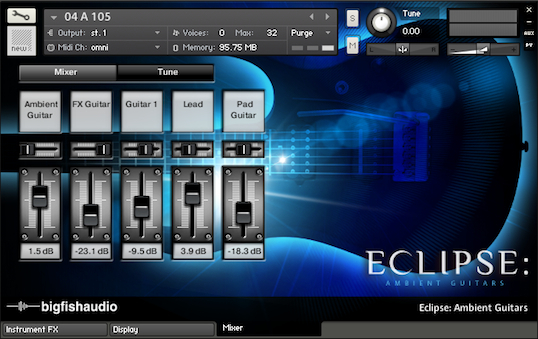 For producers who are looking to create dark ethereal ambiences, or producers looking to lighten the mood with the right combination of atmosphere and guitar, Eclipse: Ambient Gutiars will not disappoint. 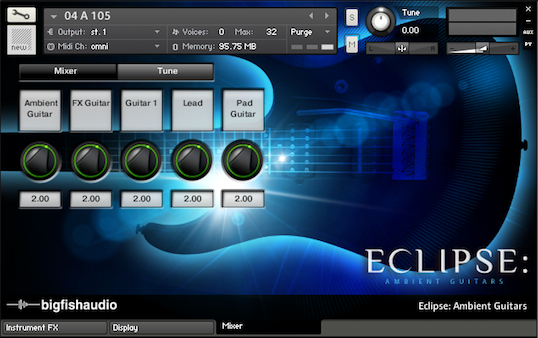 This product is part of Big Fish Audio's KLI series which includes a custom Kontakt interface. 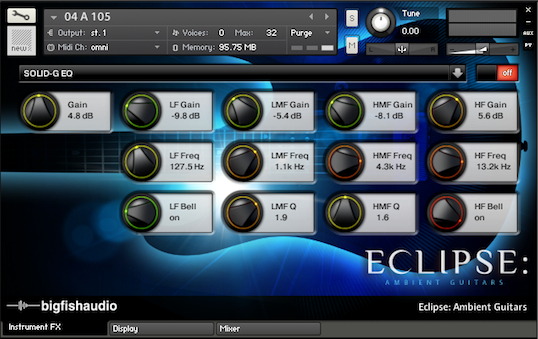 The Kontakt format includes patches of each loop and other interesting patches that contain various features exclusive to Big Fish Audio's KLI format. 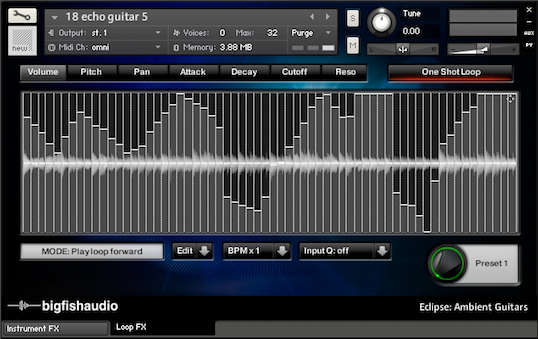 The "Sliced Loop" patches lay out each individual slice of a loop across the keyboard, making it easy to create new and original custom parts. The "Kit Combos" allow you to arrange full construction kits quickly and easily with a custom mixer and a host of included fx. Create, arrange, tweak, and mix all within the Kontakt format. 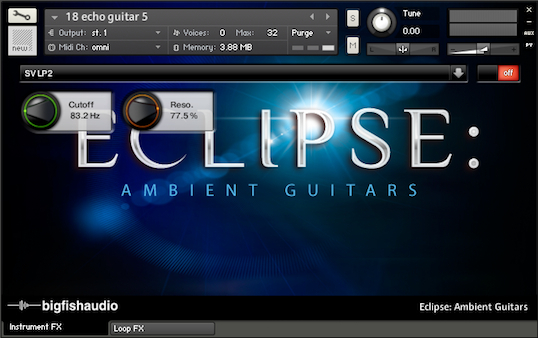 The Following End User License Agreement is included with Eclipse: Ambient Guitars. 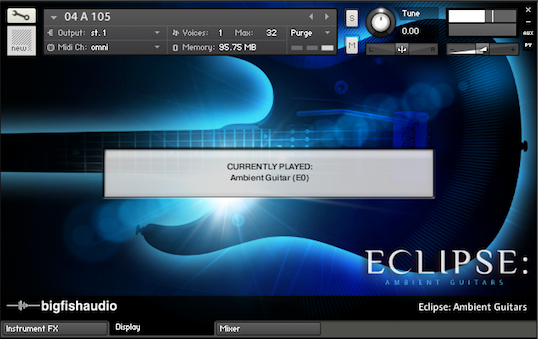 This License is only valid for the individual who has purchased an unopened, new and lawfully made copy of Eclipse: Ambient Guitars from a dealer or distributor authorized by Big Fish Audio.